Stampin' Up! UK Demonstrator - Teri Pocock: Color Coach - BLOG HOP! Color Coach - BLOG HOP! 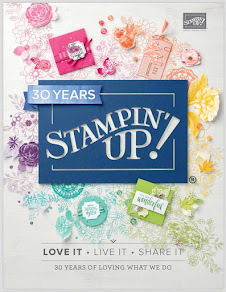 The wonderful Stampin' Up! Demonstrators over on the In Love With Stamping Forum have got together and organised a BLOG HOP for today! This Hop will highlight different colour combinations from the wonderful Color Coach (page 81 £13.50). The Color Coach is a fantastic tool ... especially if you are a little colour challenged like myself :o) It is made up of double-sided cards - one for each of the colours in Stampin' Up's colour collections. These cards suggest different colour combinations for you to try. There are even some blank cards for you to log your own favourite combinations. The Hop is consists of 25 blogs which have been split into 2 groups. I am the second in Group 2, so you may have come to me from the fabulous EMILY. If you would like to start the Hop from the start of Group 1, you will need to go to ANTHEA's blog. I used the Level 1 Hostess Stamp Set 'Because I Care' for this project. This is such a beautiful set and the Hydrangea stamp is so easy to use. I stamped the flower onto Watercolour paper using Stazon ink and then coloured it using the Aqua Painters and ink pads. I cut the image out and shaped it slightly using my Bone Folder. It is layered onto Pumpkin Pie cardstock that I have embossed using the Big Shot and the Square Lattice embossing folder. I used a sponge dauber and Old Olive ink lightly over the embossing. The Designer Series Paper is from the Brights Patterns Stack (page 91 £15.50 for 40 sheets!). I have used the beautiful Razzleberry Satin Ribbon on the card. I absolutely LOVE this colour combination! But there is no way I would have come up with it myself without the Color Coach! 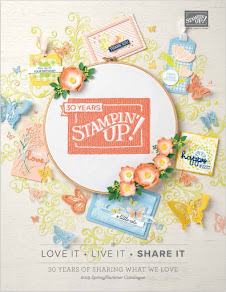 This project features the exclusive Top Note Die from Stampin' Up! The little chunky gift bag is super cute :o) It uses another of the Designer Series Paper Patterns Stacks - Subtles this time. The little Butterfly and the sentiment come from the 'Clearly For You' stamp set which is in our current Mini Catalogue. I have also used two of the small frames from the Hodgepodge Hardware kit (page 99 £25.95). The ribbon is Basic Black 5/8" Grosgrain (page 97). I used another of Stampin' Up's exclusive dies for the flowers - Fun Flowers (mini catalogue). I embossed the Cherry Cobbler flowers with the Square Lattice embossing folder and coloured the edges of them with a sponge dauber and Cherry Cobbler ink. All the flowers have been shaped using my Bone Folder. Next in the Blog Hop is the wonderfully talented Sara. I stalk this lady's blog regularly, she gives me so much inspiration with her gorgeous projects! OMG you have been busy!!! I love both your combos the first one is bright and gorgeous and the second one is classy and beautiful. I can't choose lol. Great Top Note bag too! WOW! I cant choose between them (and thats saying something for me - I LOVE ORANGE!!). Stunning projects. Thanks for sharing. Loving the Cherry Cobler,Basic Black and Baja Breeze projects........ You have been really busy. That first combo is one of my favourites. It makes my mouth water it's so juicy, lol. I hadn't spotted the other combo though, very classy and I love that bag. Brill, as always Teri. Wow - these are beautiful Teri. I particularly love the 2nd project - the bag is adorable. I love, love, love the Basic Black, Cherry Cobbler and Baja Breeze combo. Your card and that cute little bag/box are fabulous. The Hodgepodge Hardware bits really make a difference too. Oooh, what lovely combo's! I think the Cherry Cobbler, Black and Baja Breeze one would be my favourite!! I love the little Top Note bag too. I'm definitely going to have to nick that idea soon. You used the same color combos as me but in such a different way - I love it! Will definitely have a go at using pumkin pie more! a couple of great cards. the first uses my fave emb folder (will have to save up!!) and the inked technique. love the second card too. very classy and elegant.